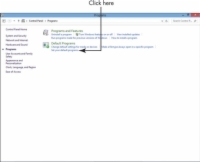 To make working with files easier, you may want to control which programs are used to open files of different types. After you make the changes, they will open automatically. 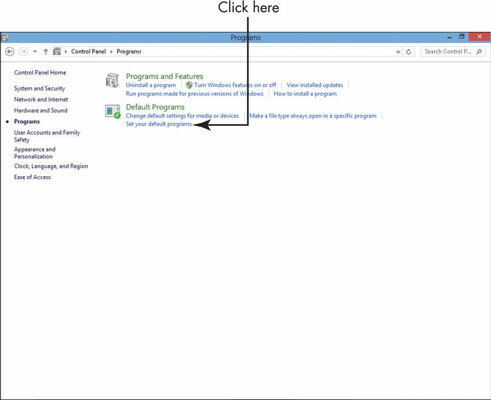 1From the Desktop, press Win+I and click Control Panel in the Settings panel that appears. The Control Panel will open. 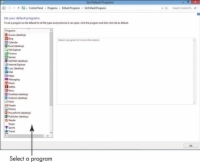 In the resulting Programs window, click the Set Your Default Programs link in the Default Programs section to see specifics about the programs that are set as defaults. 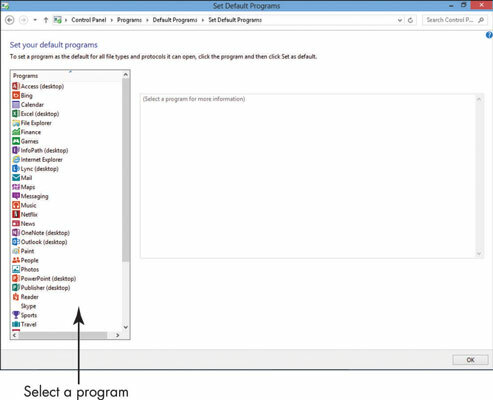 3In the resulting Set Default Programs window, click a program in the list on the left and then click the Set This Program as Default option. You can also click Choose Defaults for this Program and select specific file types (such as the JPEG graphics file format or DOCX Word 2013 file format) to open in this program; click OK after you’ve made these selections. 4Click OK to save your settings. You can also choose which devices to use by default to play media such as movies or audio files by selecting Change Default Settings for Media or Devices in the Programs window you opened in Step 2 earlier.